If you love covered bridges, Washington County, Pennsylvania, should be on your list of must-visit places. 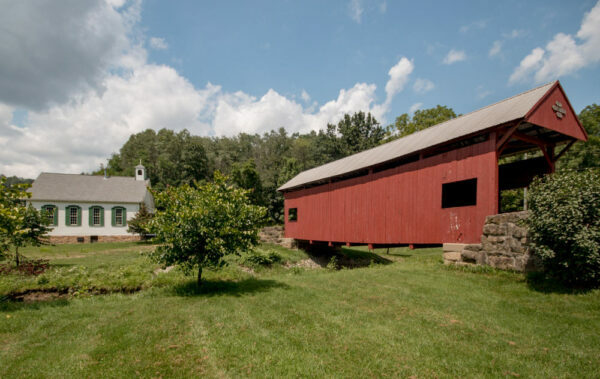 The county is home to 23 historic covered bridges, more than any other county in PA other than Lancaster County. Taking a drive to see these great covered bridges offers the chance to see some of the most rural parts of Pennsylvania, drive on dirt roads through beautiful forests, and simply enjoy the beauty of southwestern Pennsylvania. The bridges below are broken into four different regions of the county and are listed in roughly clockwise order with Washington, PA, being the center of the clock. 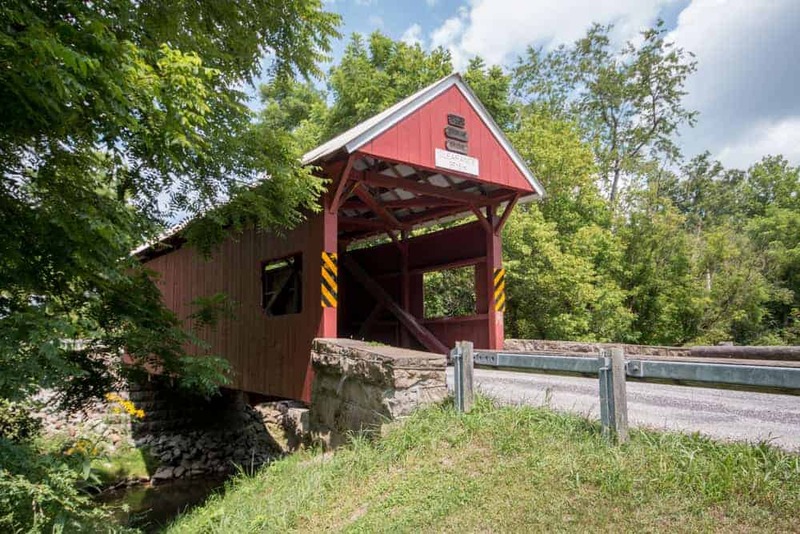 So, whether you want to simply learn the history of these bridges or want to get out and visit all of Washington County’s covered bridges, scroll down or use the hotlinks below to find out more. There are four historic covered bridges in the eastern part of the county. Two are located north of I-70 while two are located south of the highway. 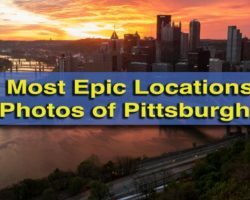 The bridges below are listed north to south, and visiting these four bridges makes for a great trip out of Washington or even from Pittsburgh. 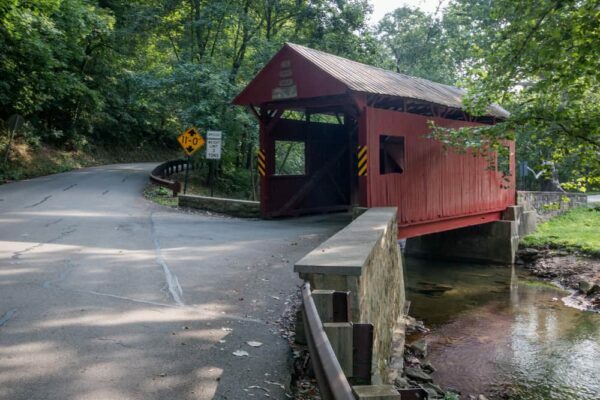 In addition to countinuing on to see more covered bridges in Washington County, these bridges are also relatively close to the last remaining covered bridge in Westmoreland County, PA.
Henry Covered Bridge is one of the most popular historic bridges in Washington County. Henry Covered Bridge is one of two covered bridges in Mingo Creek County Park. 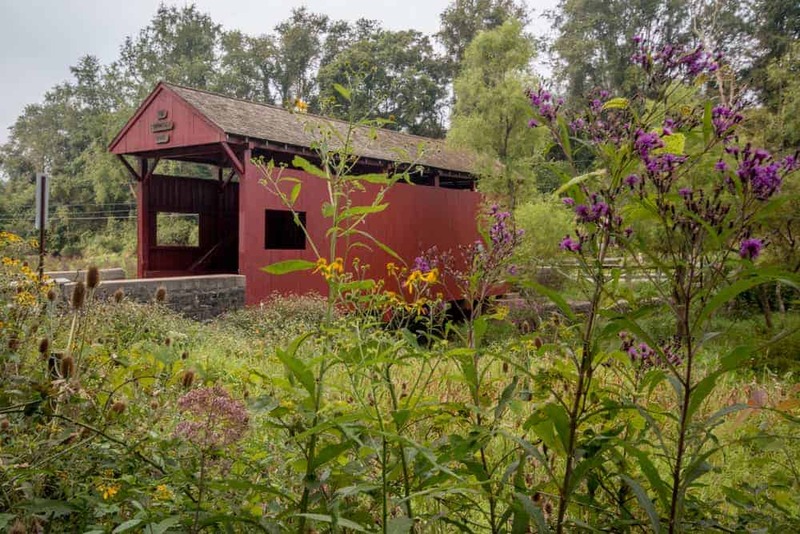 Despite its prominent location in the park and probably being one of the most visited covered bridges in the county, the history of this bridge is shrouded is largely unknown (which is the case with many covered bridges in Washington County, Pennsylvania). Most sources list the construction date of this bridge as 1881, but some list it as several decades earlier. The builder of the bridge is also unknown. Henry Covered Bridge crosses Mingo Creek and is 36 feet in length. There is no parking adjacent to the bridge, but there is a parking lot just south of the bridge on Mingo Creek Road. Your best bet is to park here and walk to 100 yards to the bridge. Ebenezer Covered Bridge is one of the most beautiful covered bridges in the county. Ebenezer Covered Bridge is the second historic covered bridge in Mingo Creek County Park. Located along a dead end road in the park’s southwestern corner, this covered bridge is one of my favorites to photograph in the county thanks to the many great angles that are available here. Ebenezer Covered Bridge is only 32 feet long and is rather unique in that the roof of the bridge only covers part of the structure. This may have been created when the bridge was moved to this site in 1977 to save it from destruction during the construction of I-70. The bridge uses a Queenpost truss like Henry Covered Bridge, and the year it was built and the maker are unknown. Getting There: Ebenezer Covered Bridge is located in the southwestern corner of Mingo Creek County County Park. It can be found at the following coordinates: 40.192074, -80.040367. To see the bridge, drive across it and park in the large parking lot on the far side of the bridge. Wright Covered Bridge is located south of I-70 in the eastern part of Washington County. This covered bridge spans the North Branch of Pigeon Creek and is only 26 feet long. Despite being very close to the highway, Wright Covered Bridge (also called Cerl Covered Bridge in some sources) is located in a peaceful spot. It was built in 1875. Getting There: Wright Covered Bridge is located along a rural road within sight of Interstate 70 at the following coordinates: 40.159096, -80.048613. The road through the bridge once crossed the interstate, but now dead ends just past the bridge. There isn’t really anywhere to pull off the road near the bridge, but since this is a dead end road and there’s nothing beyond the bridge, parking in the middle of the road shouldn’t pose an issue as long as you stay near your vehicle. 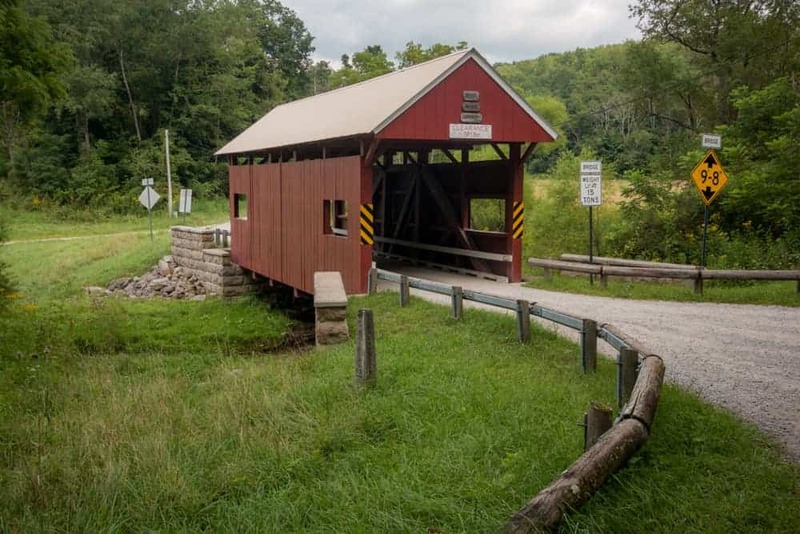 Leatherman Covered Bridge is located in a forested valley. Leatherman Covered Bridge is located in a beautiful valley in Washington County. It is believed that the bridge was built after 1860 because all the original planks were sawed, but the exact date is lost to history. Leatherman Covered Bridge is another short bridge (at only 36 feet long) and crosses the South Branch of Pigeon Creek. 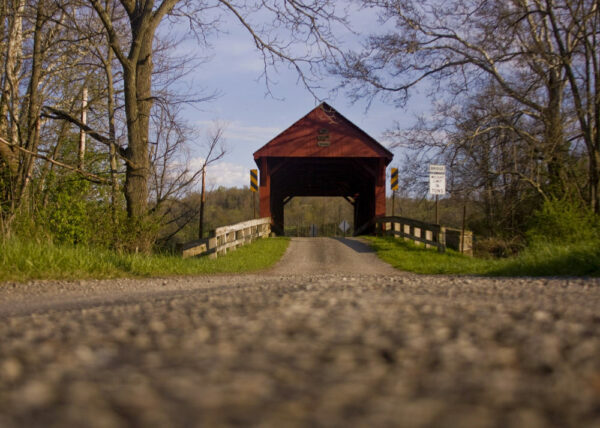 Getting There: Leatherman Covered Bridge is located a few miles south of I-70 near Little Summit, PA and Route 40. It can be found at the following coordinates: 40.120357, -80.091645. There is a bit of space to pull off along Covered Bridge Lane, which is perpendicular to the bridge. 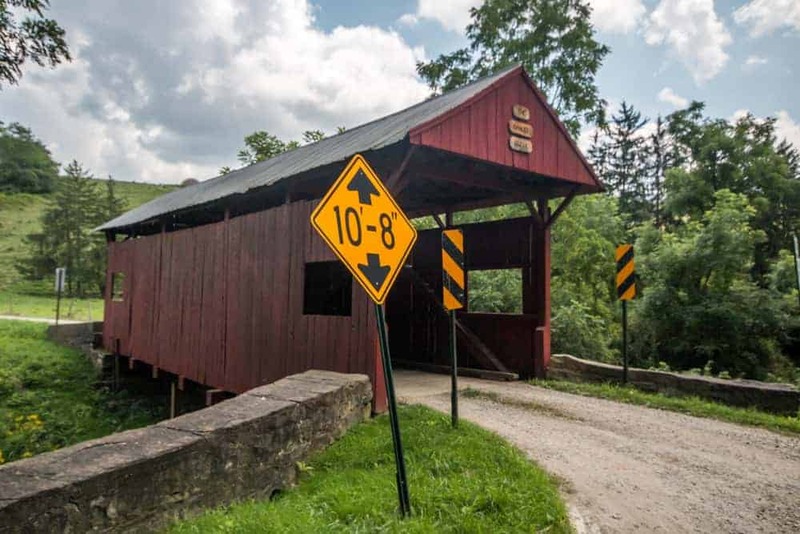 The southern covered bridges in Washington County are ideally situated along I-79, making them a great stop while traveling through the southern area of the county or for a short trip from Washington. If you are looking to explore further after visiting these bridges, you can continue to the other covered bridges in the county or head south to the covered bridges in Greene County, PA. The bridges in this section are listed east to west. Hughes Covered Bridge is located near I-79. Hughes Covered Bridge is located east of I-79 in southern Washington County. The bridge is located off the road just steps from the interstate, though can’t be seen from the highway (at least for most of the year) due to tree cover. Hughes Covered Bridge is unique in that it’s not located along a road or ever a path and is almost hidden in the woods. However, there is a small field around it which I believe (but am not 100% sure) is public land. This bridge was built in 1889 (possibly to replace a bridge that was lost in a flood in 1888). It is 55 feet long and crosses Montgomery Run. Getting There: Hughes Covered Bridge is located adjacent to a roadway that runs parallel to I-79 in southern Washington County. It can be found at the following coordinates: 40.022776, -80.172820. Parking at this bridge is a bit tricky as there aren’t really any good spots to pull off to the side of the road. Your best bet is to park next to a gated dirt road about 500 feet south of the bridge (don’t block the gate when you park). It’s possible that this entire dirt road is public property since it heads right to the bridge, but I’d recommend carefully walking on the road to the bridge. Bailey Covered Bridge was rebuilt in recent years after a fire. Bailey Covered Bridge is located a short distance from Hughes Covered Bridge on the opposite side of I-79. Bailey Covered Bridge was built in 1889 on property owned by the Bailey brothers. It crosses Tenmile Creek and is 66 feet in length. Sadly, this bridge was almost completely destroyed by an arsonists fire in 1994. However, it was completely rebuilt using its original Burr trusses and is a beautiful site to be seen. 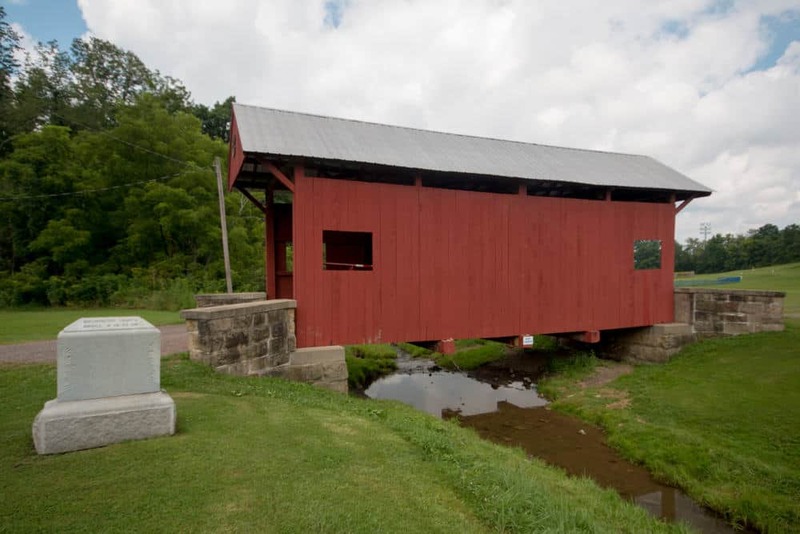 Interesting, while Burr arch trusses are by far the most common truss style in PA covered bridges, this is the only Burr arch bridge remaining in Washington County. 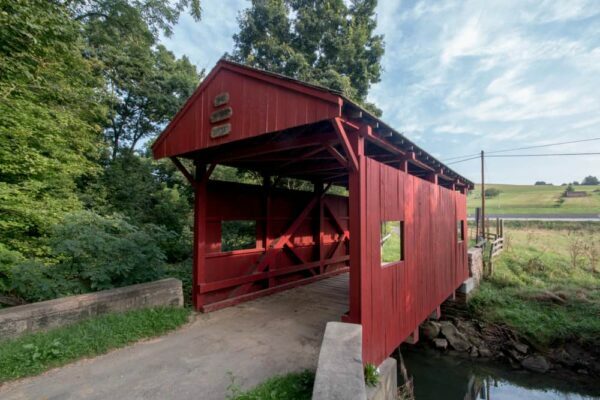 Getting There: Bailey Covered Bridge is located a short distance west of I-70 off of exit 23. It can be found at the following coordinates: 40.020608, -80.195539. There is a nice pull off on the southern side of the bridge that makes parking here quite easy. Day Covered Bridge in southern Washington County. Day Covered Bridge is located west of I-79 in a rural part of southern Washington County. This bridge was built in 1875 and utilizes Queenpost truss. It spans a mere 36 feet over Short Creek. Day Covered Bridge was closed to traffic for several years, but the necessary repairs were made and it’s now open to traffic. This bridge also has an unusually high clearance for a covered bridge, but I can’t find an explanation as to why that is. Getting There: Day Covered Bridge is located just off of Route 48 in southern Washington County. It can be found at the following coordinates: 40.029515, -80.292779. There is a small space for one car to pull off the road adjacent to the bridge. 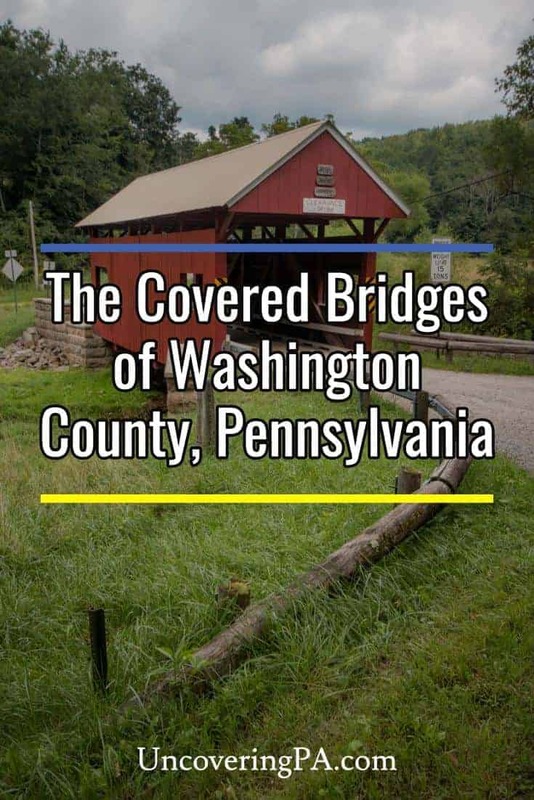 The highest concentration of Washington County covered bridges can be found in the southwestern part of the county. 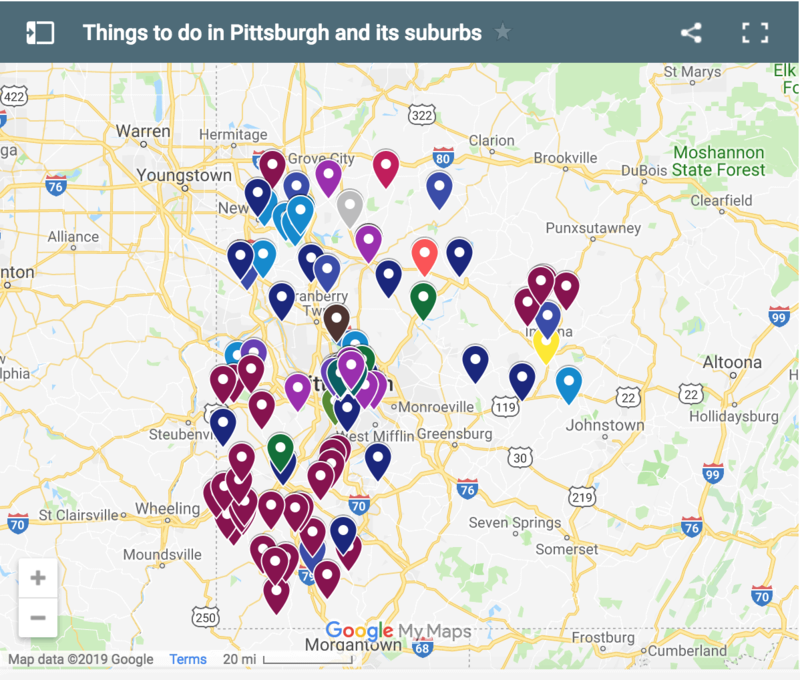 All nine of these bridges are all located south of I-70, but a decent drive from I-79. 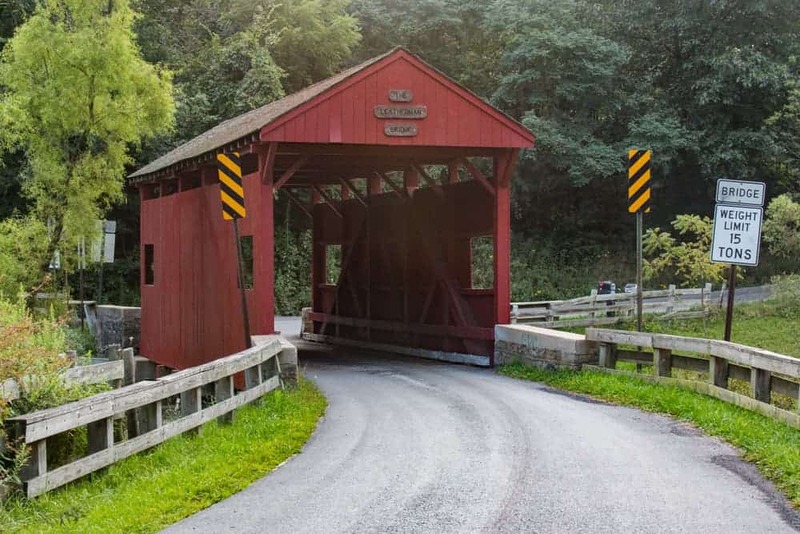 While some of these bridges are relatively easy to reach, many of these are some of the most remote covered bridges you’ll find in Pennsylvania. To see them, you’ll find yourself driving many gorgeous backroads that you’d have no other reason to explore if you weren’t hunting down these historic bridges. The bridges in this section are roughly listed south to north. Longdon Covered Bridge is one of the most rural covered bridges in Washington County. Longdon Covered Bridge, also known as Longdon L. Miller Covered Bridge is located along a dirt road near the border with Greene County. The year the bridge was built and its builder are lost to time, but it was refurbished in 2001. It spans Wheeling Creek and, despite being only 67 feet in length, is the longest covered bridge in Washington County, PA. While this bridge is located in a very rural area, it is very well maintained and even has an added stone support column beneath it. Getting There: Longdon Covered Bridge is located deep in the forests of southwestern Washington County. I assure you that you’d never find yourself here if you weren’t searching for this bridge. It can be found at the following coordinates: 39.977899, -80.446102. There is plenty of room for a car to pull off near the bridge along this lightly trafficked road. Crawford Covered Bridge is located in the southwestern corner of the county. Crawford Covered Bridge is located in the southwesternmost corner of the county. While it’s in a rural location, it’s not as isolated as Longdon Covered Bridge because it is located near several homes. Crawford Covered Bridge is another bridge that has no known building date or builder. Like many of the bridges in the county, it utilizes a Queenpost truss. It crosses the Robinson Fork of Wheeling Creek and is 39 feet in length. Getting There: Crawford Covered Bridge is located near West Finley, PA, and can be found at the following coordinates: 39.999029, -80.472698. Parking here is a bit tricky as it’s located adjacent to a home and a crop field. However, there should be enough room to pull a bit off the road on Crawford Road. Just make sure to leave enough room for another vehicle to pass. Sprowls Covered Bridge is one of many in the county along a dirt road. Sprowls Covered Bridge (not to be confused by Wyit Sprowls Covered Bridge listed further down this page) is another of the most isolated covered bridges in Pennsylvania. This bridge was built in 1875 and was rehabilitated in 2000 after being damaged due to traffic going toward a local mine. This bridge is a mere 27 feet in length and crosses Rocky Run. It is located in a beautiful valley along a gravel road. Getting There: Sprowls Covered Bridge is located in a very rural part of Washington County and can be found at the following coordinates: 40.010799, -80.406777. Parking here is quite easy as the dirt road to the bridge is not only little used but also dead ends right after the bridge creating plenty of space for parking. Danley Covered Bridge is located in a beautiful valley. Danley Covered Bridge is another bridge whose history is completely lost to time, though it’s thought it was built after 1860. 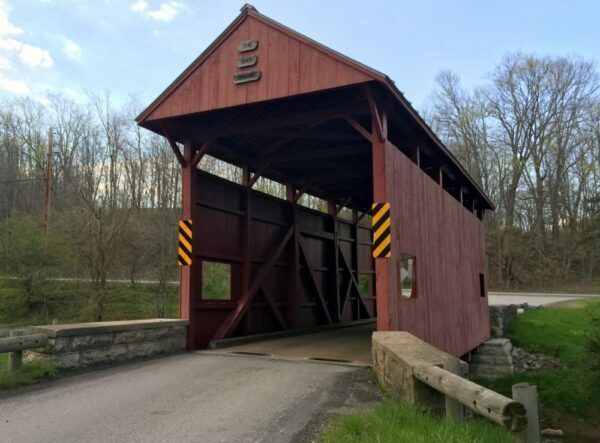 This covered bridge is 39 feet long, and it crosses the Robinson Fork of Wheeling Creek several miles upstream of Crawford Covered Bridge. It is located along a gravel road in a quiet valley of western Washington County. Getting There: Danley Covered Bridge is located in an isolated valley despite being fairly close to several other covered bridges. It can be found at the following coordinates: 40.055136, -80.439519. Parking here is quite easy given the bridge’s isolation. There are several places wide enough to pull off along the road while leaving room for other vehicles to pass. Erskine Covered Bridge is the westernmost covered bridge in Pennsylvania. Erskine Covered Bridge has a very rural feel to it despite it being located less than three miles south of I-70. It is the furthest west covered bridge in Pennsylvania and is located less than a tenth of a mile from the West Virginia border. Erskine Covered Bridge was built in 1845 and is the oldest of Washington County’s covered bridges. It is 39 feet in length and spans Middle Wheeling Creek. Getting There: Erskine Covered Bridge is located a short distance south of exit 1 on I-70 and is relatively simple to get to if you know where to look. It can be found at the following coordinates: 40.066554, -80.516228. Just prior to arriving at the bridge, there is a road that heads off to the right. There is room for a few cards to park at this intersection steps from the bridge. Plants Covered Bridge in southwestern Washington County. Plants Covered Bridge is another covered bridge located in an isolated and forested valley. While the exact year of its construction is unknown, it is thought to have been built after 1880. 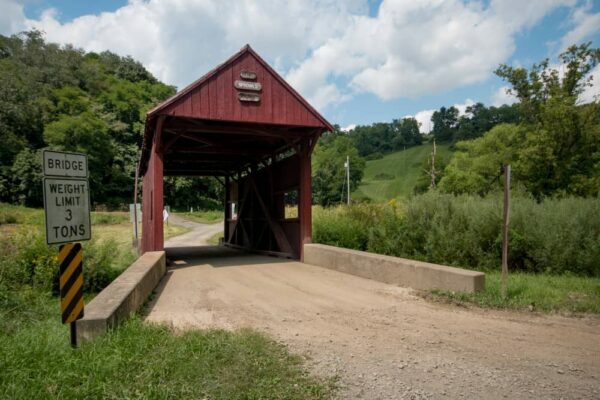 At 24 feet, 6 inches long, it is six inches longer than the shortest covered bridges in the county. It crosses the Templeton Fork of Wheeling Creek. Getting There: Getting to Plants Covered Bridge requires driving for several miles on dirt roads. It can be found at the following coordinates: 40.021147, -80.416149. There is plenty of room across from the bridge along Templeton Run Road for several cars to park. Wyit Sprowls Covered Bridge currently sits next to a historic one-room schoolhouse. Wyit Sprowls Covered Bridge is located in East Finley Township Park. It was moved here and rebuilt in 2001 to save it from destruction. Currently, it sits next to what I believe is a historic one-room schoolhouse. 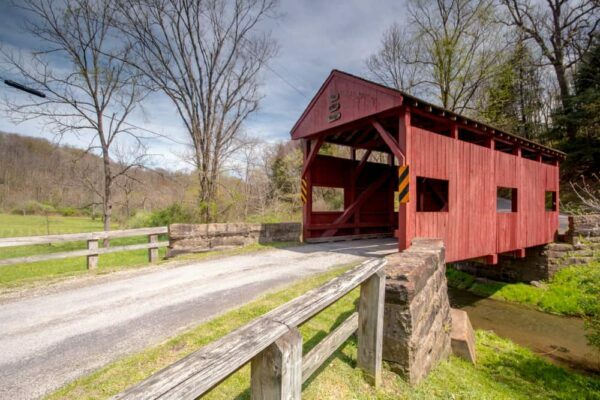 The bridge was originally located in West Finley and was built in 1915, making it one of the few historic covered bridges in Pennsylvania built in the 20th century. This bridge is one of two in the county that were built during World War I because there was a lack of steel for bridge making during the war. 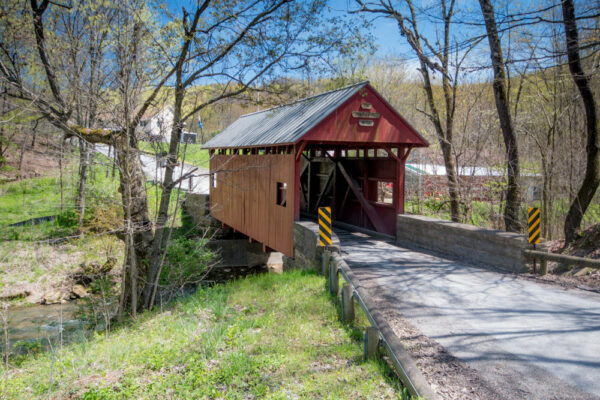 Today, Wyit Sprowls Covered Bridge is 43 feet long and crosses the Templeton Fork of Wheeling Creek upstream of Plants Covered Bridge. Getting There: Wyit Sprowls Covered Bridge is located in the peaceful East Finley Township Park. It can be found at the following coordinates: 40.038455, -80.403164. While there is no paved parking lot in the park, there are plenty of places to park your car while checking out this bridge. Mays Covered Bridge is located along a beautiful dirt road. Mays Covered Bridge, also known as Mays Blaney Covered Bridge, is yet another isolated covered bridge located along a dirt road. Despite its isolation, this bridge is located less than two miles from exit 1 on I-70. Mays Covered Bridge is 31 feet long and crosses Middle Wheeling Creek several miles upstream of Erskine Covered Bridge. It was built in 1882. This bridge was last refurbished in 2006 and, somewhat astonishingly, still has much of its original pine siding. Getting There: Mays Covered Bride is an easy drive from I-70 and can be found at the following coordinates: 40.088216, -80.487459. There should be plenty of space to pull off of the road along Waynesburg Road to the north of the bridge. Brownlee Covered Bridge is located in a community park over a seasonal stream. Brownlee Covered Bridge, also known as Brownlee-Scott Covered Bridge, is located in McGuffey Community Park just south of I-70. It was moved to this park in 2008 from East Finley to save it from destruction. Today, Brownlee Covered Bridge crosses the typically-dry creekbed of Dutch Fork adjacent to a nice playground and youth baseball fields. The exact date of construction is unknown but is thought to be after 1860. It is 31 feet long and once crossed the Templeton Fork of Wheeling Creek. Getting There: Given it’s located in a town park, this is one of the easiest covered bridges to reach in Washington County, Pennsylvania. It can be found at the following coordinates: 40.109537, -80.422879. Since this is a community park, there are several parking lots a short walk from the bridge. 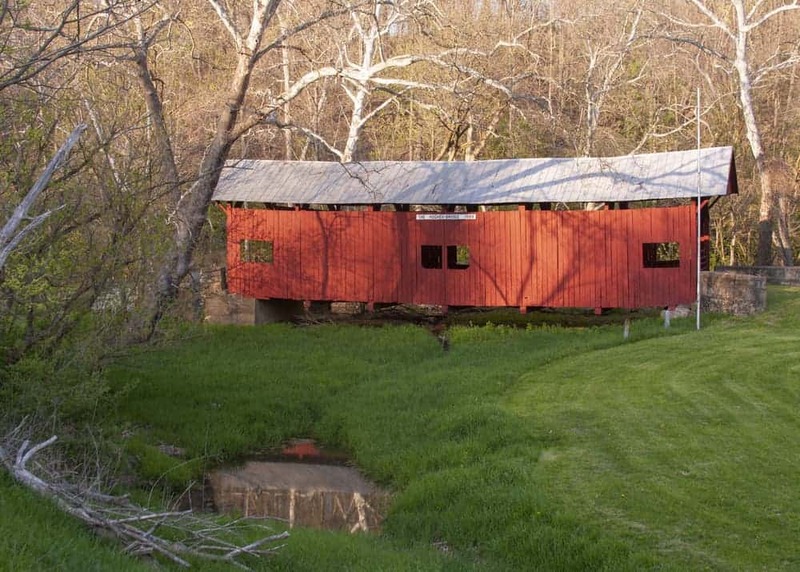 There are seven historic covered bridges located north of I-70 and west of I-79 in Washington County. While these bridges aren’t as compactly located as some of the others in the county, they still are quite beautiful and you won’t regret taking time to see them. It should be noted that one of the seven historic bridges in this portion of the county, Ralston Covered Bridge, is located on private property and thus not covered in this guide. I have also not included Wilson Mill Covered Bridge in McDonald as it is a modern recreation of a historic bridge, but not near the bridge’s original location. The bridges here are listed roughly in clockwise order starting in the southwest. Sawhill Covered Bridge is one of only two historic covered bridges in PA built during World War I.
Sawhill Covered Bridge is located north of I-70 and is one of the closest covered bridges to downtown Washington, PA, though it’s not especially close to the city. It was built in 1915, one of the two historic covered bridges in the county built during World War I because of difficulty obtaining steel. The bridge is located a few miles north of I-70 and Route 40 just off of the fairly busy Route 221. Make sure you are paying attention, as it would be easy to drive right by this bridge and miss the turnoff for it. Sawhill Covered Bridge crosses Buffalo Creek and, at 57 feet, is one of the longest covered bridges in Washington County, PA.
Getting There: Sawhill Covered Bridge is located on a turn off of Route 221 5.5 miles north of Route 40. It can be found at the following coordinates: 40.180189, -80.416169. Parking here is quite easy as the road dead ends immediately after crossing the bridge. There is plenty of space here for several cars to park. Pine Bank Covered Bridge is located on the grounds of Meadowcroft Rockshelter. Pine Bank Covered Bridge is located on the grounds of Meadowcroft Rockshelter and Historic Village, one of the most amazing historical sites in all of Pennsylvania. Unfortunately, to see this bridge you have to pay an admission cost and the site is only open during part of the year (I highly recommend seeing this site for reasons beyond the bridge). Pine Bank Covered Bridge was built in 1871 in Greene County, Pennsylvania. 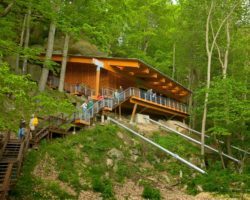 It was brought to the grounds of Meadowcroft Rockshelter in 1962 to be part of its 19th-century settler’s village, which consists of other historic buildings moved to the site. 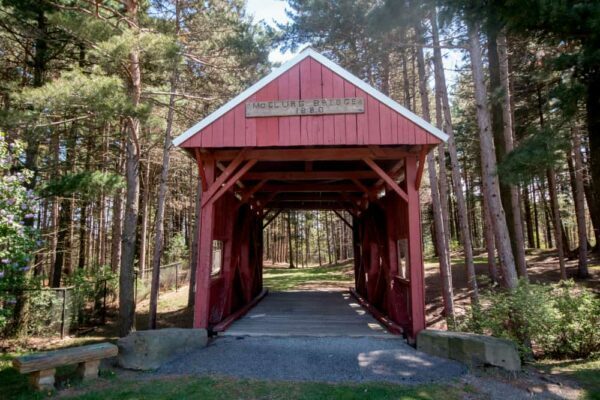 Today, Pine Bank Covered Bridge crosses a ravine and is 43 feet long. Getting There: Pine Bank Covered Bridge is located at Meadowcroft Rockshelter near the West Virginia border. 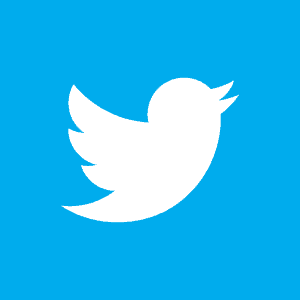 The site’s address is 2759 Meadowcroft Rd, Avella, PA 15312. Parking here isn’t an issue, though a walk is required to see the bridge. 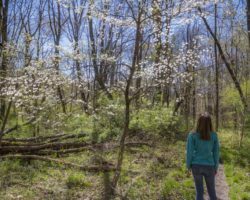 Meadowcroft is open May through October. See their website for full hours of operation and admission costs. McClurg Covered Bridge sits in a wooded section of a township park. 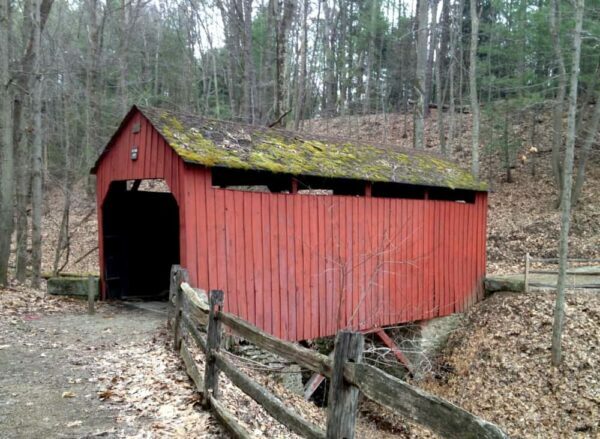 McClurg Covered Bridge, also known as Devil’s Den Covered Bridge, is located in Hanover Township Park. This bridge was built in 1880 and moved to the park from nearby Paris, PA, in 1987. Currently, the bridge crosses a small ravine in a wooded area of the park. While it doesn’t cross water anymore, this is still a striking location for the bridge. McClurg Covered Bridge is 24 feet long, tying it for the shortest covered bridge in the county and possibly the shortest in all of Pennsylvania. 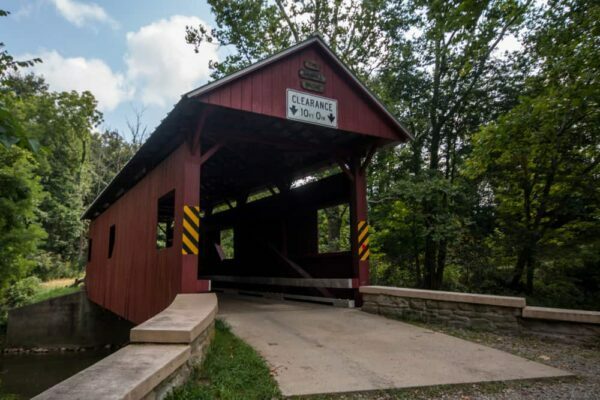 Getting There: McClurg Covered Bridge is located in Hanover Township Park at approximately these coordinates: 40.424159, -80.446468. There is ample parking next to the township building, though a short walk through the park is required to see the bridge, which sits on the far side of the playground. Jackson’s Mill Covered Bridge is located near Hillman State Park. Jackson’s Mill Covered Bridge is located north of Route 22 near Hillman State Park and Raccoon Creek State Park. While the year this bridge was built is unknown, it is thought to be named after William Jackson, an owner of a mill in the area in the 1870s and 1880s. So, it likely dates to that time frame. This bridge utilizes a Queenpost truss like many of the covered bridges in the county and is 35 feet long. It crosses King Creek and was refurbished in 2003. 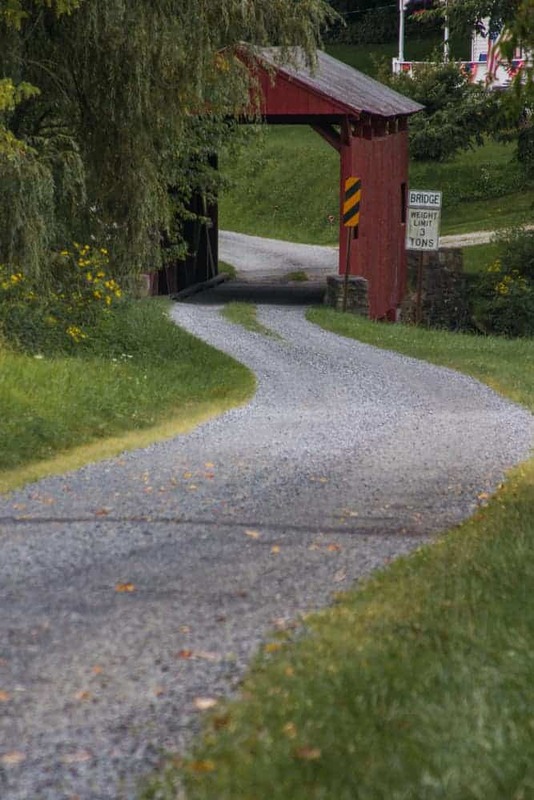 Getting There: Jackson’s Mill Covered Bridge is located in a beautiful valley north of Route 22 and west of Route 18. It can be found at the following coordinates: 40.423921, -80.489254. Due to nearby homes, parking here is a bit tricky, but you should be able to find space to pull off to the side of the road near the bridge. Lyle Covered Bridge is located on the edge of Hillman State Park. Lyle Covered Bridge is located on the northeastern edge of Hillman State Park. If you are visiting the park, make sure you don’t miss this beautiful bridge. This bridge was built in 1887 and refurbished in 1999. It is 38 feet long and spans Brush Run. Lyle Covered Bridge’s setting along the edge of the park and surrounded by fields and forests make this one of the most picturesque of Washington County, PA’s covered bridges. 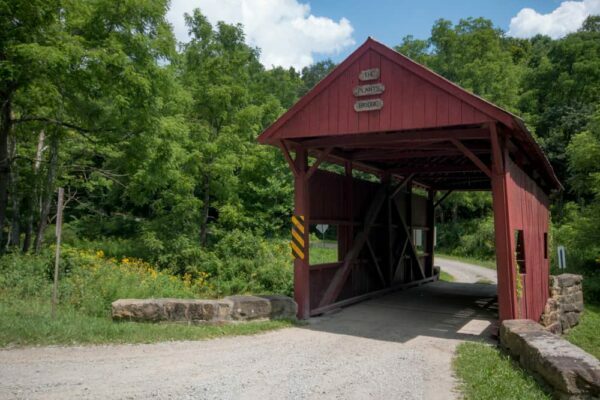 Getting There: Lyle Covered Bridge is located north of Route 22 and close to some great hiking in Hillman State Park. If you are visiting the park, the bridge is noted on the park map. It can be found at the following coordinates: 40.454270, -80.375517. There is room to pull your car off the road on the bridge’s western side. Krepps Covered Bridge is one of the closest covered bridges to Pittsburgh. Krepps Covered Bridge is one of the closest covered bridges to Pittsburgh. 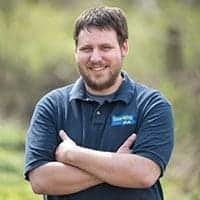 It is located a short distance east of Route 18 near Atlasburg, PA.
Krepps Covered Bridge is a mere 24 feet long, tying it with McClurg Covered Bridge as the shortest covered bridge in Washington County and possibly all of Pennsylvania. It crosses Raccoon Creek well upstream of the park of the same name. Little is known about its history as its date of construction and builder have been lost. Getting There: Krepps Covered Bridge is located a few miles east of Route 18 and north of Route 50. It can be found at the following coordinates: 40.340858, -80.331018. There is room for several cars to pull off the road at the intersection of Water Dam Road and Covered Bridge Road near the bridge. If you are looking for more places to explore nearby, there are many great options. 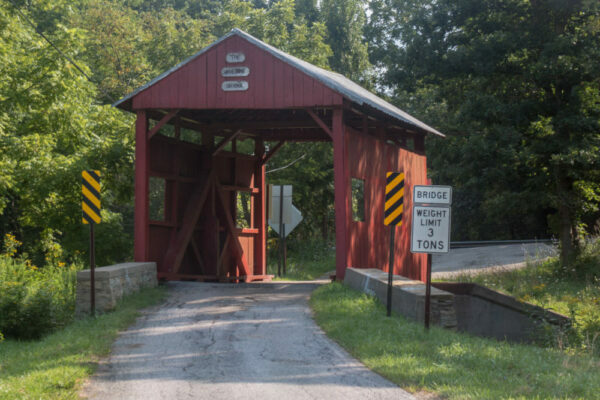 If the nearly two dozen covered bridges in Washington County aren’t enough, there are seven remaining covered bridges in Greene County to the south. There is also one remaining bridge in Westmoreland County. 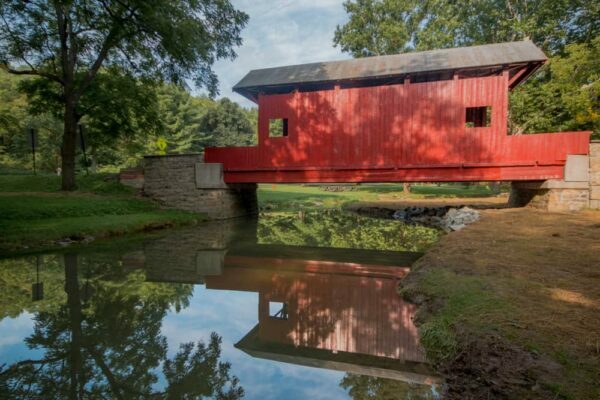 You can see all the covered bridges we’ve written about on our PA Covered Bridges page. 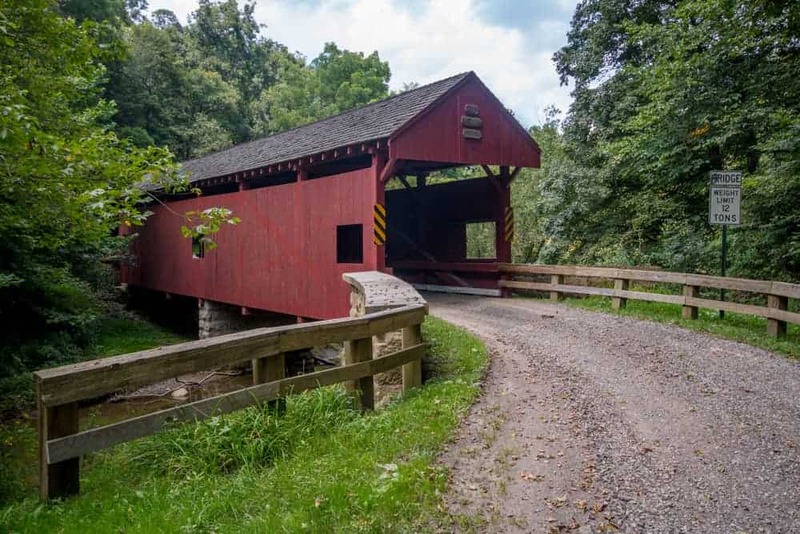 Looking beyond covered bridges, visiting Washington County’s bridges will take you near great spots like Meadowcroft Rockshelter, Frankfort Mineral Spring Falls, and the Pennsylvania Trolley Museum.